This Thursday each student will write a persuasive paper about the film WALL-E and its connections to any of the topics we have covered in the media unit so far. local versus global food products and "getting back to the land"
Listed below are links to some blog entries that all "read" WALL-E with a critical eye. Each writer provides a unique and very strong perspective on the film and what he/she feels is the central message presented in the animated text. Some of the theory and ideas presented in the above blog posts are a bit advanced for Grade 10, but take each set of ideas as a general guideline for how your personal thoughts on the film MIGHT be explored. Pay attention to the use of persuasion and rhetorical devices in each piece. What is it about the WAY the authors are writing that draws you in as a reader? That is the effect you should be trying to achieve with your paper on Thursday. A big thank you goes out to Kyla Cotton who came to speak to our class about her local business The Urban Harvester. The Youtube video below shows the process of the Barrie Community Garden being built. For those of you who are curious it is located in Sunnidale Park behind the Canadian Tire on Bayfield Street. Please respond in the "comments" section with your favourite kind of edible (thing to eat from the garden) or your favourite fresh meal. Recipes would be great too if you would like to share with your classmates. During this unit we are looking at advertising and perception and its effects on body image and overall health. A secondary lesson to be looked at is how various people speak out about these issues. In other words, the documentaries and lectures that we are watching are ALSO trying to communicate information in a convincing and informative way. They are not trying to sell a product, but they are providing information about products and perceived value. Eventually YOU will be asked to prepare a short speech on a topic that you are passionate about. You will be required to use all the knowledge you have gained during the unit about perception and effective communication to get your message across to your classmates. Jamie Oliver is a famous British chef who is currently trying to start a Food Revolution in a small town in America. Please go to this link: http://www.ted.com/talks/jamie_oliver.html and watch his TED Prize speech. His message is simple, he wants to educate every child about food. After you watch the 20 minute video please respond in the "comments" section above. What do you think about Jamie's message in light of the documentary "Killer at Large" that we watched in class? What are the barriers to accomplishing this goal? Should we be doing something like this in Canada? If so, why? Would you want to participate in a food revolution? Why or why not? This week we continue our media unit looking at fast food (and just generally bad food), what is does to our bodies, and how advertising asks us to see ourselves. Believe it or not all of these things are connected in ways many of us are not even aware of. For now check out this link: http://www.glamour.com/health-fitness/blogs/vitamin-g/2010/04/the-shocking-fast-food-experim.html to see an interesting home experiment involving a favourite fast food item. This week coming up is short, but busy. Tuesday 6th - "Portable Phonograph" short story questions due. Friday 9th - Media Unit begins. 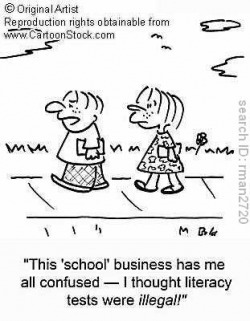 The Literacy Test will take place on THURSDAY, APRIL 8th, 2010 at Bear Creek. Grade 10 students are expected to take the bus to school or walk as usual and take the test between 8 am - Noon. Practice tests along with tips and tricks for being successful are available here: http://www.eqao.com/Students/Secondary/10/10.aspx?Lang=E&gr=10. This test is a requirement for graduation so please make sure you come prepared and do your best. Practice sessions have also been going on in all classes this month to help you ready. All Grade 9, 11, and 12 students will be picked up later for a half-day schedule. I will post more details once times are finalized. Students all have their own websites to post journal entries for their Independent Novel Study Unit (ISU). Class time will be given to do this, but students who do not have access to Internet at home are encouraged to visit the library at lunch to work on this project if necessary. Click on the link below to go to the Nobel Prize website. Here you will find an interactive review game for the novel. Test your memory and see how you do. You might also get some good information for your Big Project which is due this Thursday. Enjoy!